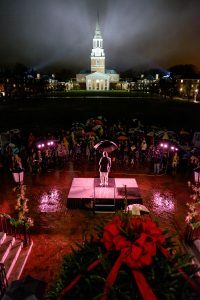 Students, faculty, staff and off-campus community members are expected to gather on Hearn Plaza on Dec. 6 for the 13th Annual Lighting of the Quad. The event will begin at 7 p.m. and all are invited. Organized by the Wake Forest Student Union, the event will feature performances of holiday songs by student a cappella groups, music from Wait Chapel’s carillon, remarks by Chaplain Tim Auman and President Nathan O. Hatch and the official “lighting of the quad.” Holiday lights on a Christmas tree and other Hearn Plaza trees will be turned on, a menorah will be lit and attendees will form a circle holding candles distributed at the event. Leading up to the event, the VSC and Student Union are collecting clothing to donate to the Potter’s House in Winston-Salem. Hats, scarves, gloves, blankets and more are being collected on the second floor of Benson University Center. Those items can also be brought to the Lighting of the Quad for donation. In addition to the tree lighting, the University is now hanging dozens of holiday wreaths on buildings across campus.